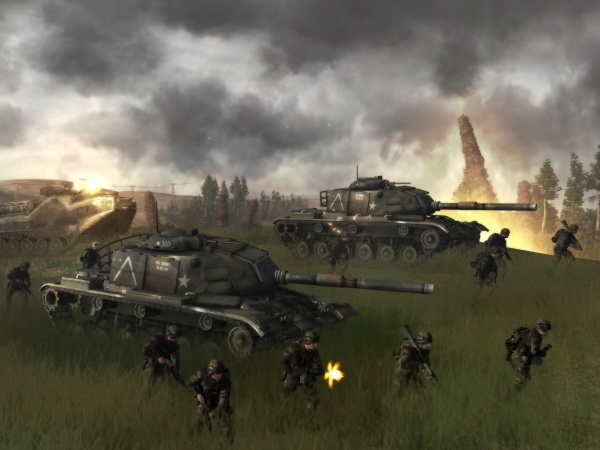 World in Conflict is exciting and entertaining. It's engaging. It looks fantastic. But it's not really a strategy game. It's more of an action game played with multiple units and the camera pulled way back. If you pick up the game expecting it to be one of the best RTS games in recent memory, you may find yourself noticing many faults with it and will ultimately end up disappointed with the game. If instead you just let yourself get lost in the pandemonium of the whole thing, you'll more than likely have a good time. The game is set in 1989 and in this world the Cold War has turned hot. The Soviet Union has invaded Western Europe and once the US is thoroughly distracted by the conflict, it sneaks through the back door and invades the US at Seattle. By using cargo ships to transport its troops, the Soviet Union is able to catch American defenses by surprise and quickly establish a beachhead and begin a push inland. While the story provides an excuse to let you take on T-72s with M-1s in the shadow of the Space Needle, it's strictly the stuff of cheesy Hollywood action movies ala Red Dawn. If you get hung up on the plausibility of the whole thing, you're not going to have any fun. You'll be focused on things such as why no one thought it was suspicious that so many cargo ships showed up at once, calculating how long it would take to offload an invasion force from commercial ships, and where the seemingly infinite supply of paratroopers are being staged from instead of protecting civilian refuges in the Kingdome from a Soviet armored thrust. My advice to you is to do the same thing that you would for a summer blockbuster movie: just go with the flow and enjoy the special effects. The game manages the scale of the battles by putting you in direct control of only a handful of units at a time, with the AI managing the majority of your friendly units. This fits within the framework of the objectives, though, as your commanding officer will give you specific tasks as the battles unfold. This makes you feel like you are part of a coordinated effort and doing your part for the overall success of the battle, although it does take strategic control out of your hands. There's no resource gathering in the game although you do accumulate points which can be spent to request support missions or reinforcements. With reinforcements you'll have your choice of various armored fighting vehicles and specialized infantry squads, with the more powerful units naturally costing you more of your supply points to purchase. You'll need to make the age-old quality versus quantity decision when selecting your reinforcements, but even if you go for "quantity" you're not going to be able to amass the kind of army you can in many strategy games. The game controls the flow of the supply points and they don't come in quickly enough for you to flood the map with units. As a way to further prevent you from kicking back and waiting until you have a force of 50 M-1s with which to lay waste to the enemy, many objectives in the game are timed and you'll also lose a mission if you lose control of a strategic point for too long. The game is intent on making you make do with a small force. The game does provide your units with backup, though. You'll often have the ability to call in support missions that include a variety of artillery and air strikes. Like with your reinforcements, points are needed to call in strikes. Each type has an associated point cost and some strikes have multiple levels - you can spend 5, 10, or 15 points on a mortar barrage, with the intensity of the strike dependent on the number of points spent. Each strike also has a time delay associated with it, so you'll need to be careful to direct the strike to where you'll believe the enemy will be when the strike hits. The support missions are a big component of the game because without them you're not going to have much success against the enemy's superior forces. Not only that, they look incredibly cool. It's hard not to get excited when you see an A-10 come roaring across the battlefield to light up a column of Soviet armor.